Adam Harper, Infinite Music, Zer0 Books, 2011. "In the last few decades, new technologies have brought composers and listeners to the brink of an era of limitless musical possibility. They stand before a vast ocean of creative potential, in which any sounds imaginable can be synthesised and pieced together into radical new styles and forms of music-making. But are musicians taking advantage of this potential? How could we go about creating and listening to new music, and why should we? Bringing the ideas of twentieth-century avant-garde composers Arnold Schoenberg and John Cage to their ultimate conclusion, Infinite Music proposes a system for imagining music based on its capacity for variation, redefining musical modernism and music itself in the process. By detailing not just how music is composed but crucially how its perceived, Infinite Music maps the future of music and the many paths towards it." 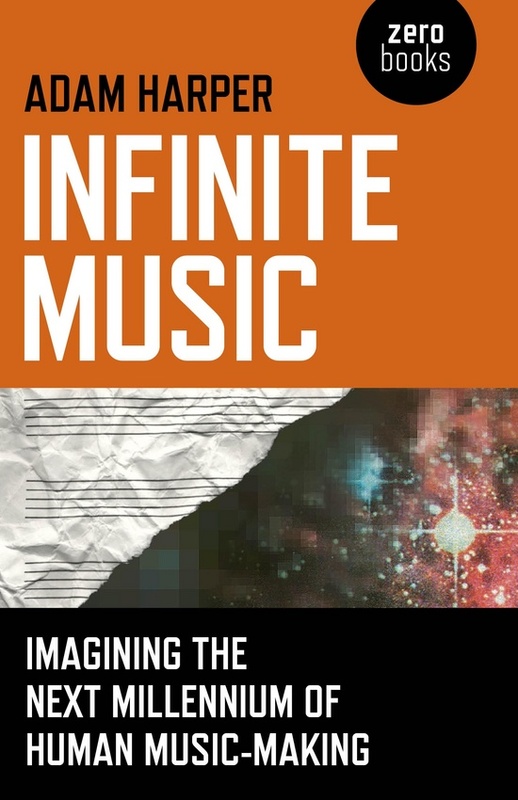 "In his new book Infinite Music, Adam Harper brings the ideas of Varèse, Cage and other visionary 20th century composers to their ultimate conclusion, proposing a system for imagining music based on its capacity for variation, redefining both musical modernism and music itself in the process. From Indeterminacy to Ableton Live, from Alan Lomax's Cantometrics system to the timbral innovations of Burial, Infinite Music maps a present in which radical methodologies and new technologies have brought composers and listeners to the brink of an era of limitless musical possibility. We stand before a vast ocean of creative potential, in which all sounds can be synthesised into new styles and forms of music-making. But are musicians taking advantage of this potential? And how could we go about creating and listening to new music, and why should we? "This book argues that musical modernism is not a state or a set of particular techniques or characteristics, but a direction. Modernism moves away from the strictures of tradition, progressively tearing them away piece by piece and leaving them behind as it travels towards an ultimately infinite potential for musical variety. In doing so it enhances the ways in which we perceive, imagine and live in the world. But there isn’t just one, general and absolute path towards the infinite point of musical modernity, an assumption that came to stifle modernist music until it became, ironically, a new orthodoxy. Rather, each path is relative to a different starting point, a different context of convention. Modernism is a multi-directional and multi-dimensional process, and there are as many paths toward musical infinity as there are ways of composing and listening. Modernity is the challenge of the infinite within the capacities of the present. Musical modernists seek to maximise the possibilities of composition to the utmost degree, taking in equally both its broad and deep possibilities and those at the finest levels of detail (composers regularly lose themselves between these two extremes, ignoring or unaware of the entire range). This infinity of possible permutations in musical variety has often been a topic of discussion. In 1959 the composer and conductor Leonard Bernstein gave a television lecture entitled ‘The Infinite Variety of Music’, concerned with, as its title suggests, the richness of musical variation. To illustrate this, Bernstein took a simple sequence of four pitches and gave a number of examples of how that sequence had been varied across different examples of (mainly Western classical) music. In a preamble he noted that the number of other possible combinations of pitches stretched to a number that was over a hundred digits long. With chords (i.e. more than one pitch sounding simultaneously) taken into account, this number increases to over three hundred digits. Of course, not only did this just describe the numerical potential of one variable – pitch – but it only took into account the twelve pitches of the Western classical system. With the much finer possibilities and control over musical variables offered by recently developed and increasingly accessible electronic music technology, this number truly explodes. Since the nineteen-fifties (the heyday of Bernstein and musical modernism) countless musical performances have occurred and musical variables invented, used and perceived that cannot be counted within Bernstein’s number. Many of these came from an arena of music-making some still call ‘popular music’ – the term is quaint, in many ways incorrect, in some contexts has an offensive tinge, and will probably lose its currency over the next century. ‘Popular music’ can either mean ‘music that is widely appreciated’ or else music for ‘the people’ or by ‘the people’, regardless of how many people actually appreciate it. I’m referring to the third category, but either way the term is generally a catch-all category for music that isn’t thought to be Western classical music. Since the Second World War this ‘popular music’ has been increasing exponentially in diversity and complexity, incorporating new, technological structures and forms and becoming a powerful new site for musical modernism. It hopefully goes without saying, then, that modernist music isn’t limited to one particular musical style or genre, but can and will manifest through hundreds and thousands of different styles. In any case, the main thrust of musical modernism has largely fallen out of the hands of Western classical music over the last fifty years. In its current state, it rarely offers those hungry for the musically new anything more than convention upon convention – a long, deep and undeniably rich tradition that Schoenberg never escaped from. These conventions are sonic, but in the end they are deeper still: the concert, the concert hall, the smartly dressed musicians playing age-old instruments of wire, wood and brass, the silenced audience. Too often, the elitism is social as well as artistic. Western classical music – we could call it ‘non-popular music’ – has long ceased to assume a place of absolute privilege and priority in musical culture as a whole. It’s given and may well continue to give us some of those works of art our culture has appreciated the most, but today its general tendency towards myopic traditionalism and exclusivity makes it tiny against the enormous backdrop of infinite musical possibility, which is calling more loudly than ever before. A number of the cultural assumptions we make about music and musical concepts live on, however, inherited from centuries of Western classical music and its aesthetic ideologies. A ‘composer’, for example, is routinely held to be a specially trained person (usually a man) who writes music using Western classical notation, which is then given to an ensemble of specially trained musicians playing Western classical instruments. But technically the word ‘composer’ suggests anyone at all who might create music. In this sense, the term overlaps with the word ‘performer’. Composers may also come in groups that collaborate on the creation of music. In this book I retain the word ‘composer’ because of this fundamental meaning, but in no way should it be assumed that I am talking about classical music, or classical music composers, or composers who write for live or acoustic instruments, or specially trained or professional artists. No, with the word ‘composer’ I’ll be referring to any source of music at all, multiple or otherwise, including performers (be they singers or instrumentalists), producers, singer-songwriters, ‘artists’, sound artists, DJs and other selectors, artificial sources and even, in a significant sense, people who play music to themselves alone, with an instrument or the press of a button. We can all be composers, and we are all composers. This must not be forgotten as you read. Nor does the term imply any particular value or privileged position – all these figures are equal. To emphasise all of this, I’ve only used the word in plural form. Similarly, when I talk of the possibilities of ‘music’, I don’t prioritise or ‘really mean’ classical music, as the term is often used in certain circles. Nor do I ‘really mean’ any sort of popular or Western music. I don’t even ‘really mean’ ‘art’ music, or ‘difficult’ music, or ‘serious’ music – awkward terms that have been used to differentiate, separate and territorialise musical activity in the past. I don’t even mean whatever we consider to be ‘good’ music. I mean music in all its senses, all its past, present and future senses. Music in senses that haven’t even been discovered or practiced yet. Music before categories and without prejudices, to the fullest possible extent of the word’s meanings and consequences. How can music be infinite in such a way? Its possibilities can’t literally become actualised as infinite, of course, as long as the various systems that perform music are somehow finite, which will necessarily be the case since the universe itself is physically constrained. For this reason we should consider these possibilities virtually infinite. Besides which, an infinite variety of music isn’t necessarily desirable in itself. Even with the best intentions it can’t be denied that we appreciate some permutations of musical possibility more than others, depending on context, and that our capacity to appreciate music has some relation to the prior musical systems we’ve become familiar with. Does musical modernism fail to take this into account? Only partially – if modernism is a directional process, the music it creates is always somewhere between the old and familiar and the indiscriminate infinity of different forms, proceeding only toward the latter. It’s a relation between old and new, and any given moment of modernist music will present a mixture of what can be appreciable to a given audience to any extent as either old or new. So not only must modernism reject any one absolute system, path or final resting place, but it must also situate itself with respect to the familiar in some way, however small, and this link with or establishment of the familiar is what can facilitate appreciation. Here, perhaps, is a way to bringing more listeners to modernist music than it won in the twentieth century. But why all this talk of modernism and infinity? Why does music need to align itself with the maximum compositional possibilities of its time? Aren’t things just fine the way they are? Why write this book? The issue is one of imagination. Music is one of the activities that can stoke it, and not just in some abstract, exclusively artistic sense. There is no absolute border between the musical imagination and the imagination of anything else in life. The widening of an imagination to accommodate a new and unusual idea or possibility can be a rewarding experience in itself, but this process is also the engine of our development and betterment as individuals and as societies. Sometimes ideas become difficult to imagine; often we can’t tell when our imaginations have become limited and we can no longer detect what might lie beyond their horizons, making us ignorant both of the way things really are and the way things might one day be. I would argue that music, both in its composition and in its appreciation (not entirely differentiable categories, as we’ll see), often faces such a predicament and is actually facing one today. For many people it’s difficult to imagine the future of music as being anything very different to what it is at present. This is compounded by the notion that in the last century we’ve supposedly learned the lesson that radical musical innovation will only be unsuccessful. We might even lapse into an attitude of some cruel irony concerning matters of glittering, confident musical futures, an irony by turns tragic or mocking. Or else we ignore it, or remain ignorant entirely. Either way we’ve perpetuated the status quo. Written ten years into a new millennium that has already seen widespread and significant technological change as well as scientific discovery, this book is not primarily a guide to what will happen in the next thousand years of human music-making (if we survive that long), although it does make a few predictions and suggestions, and its system is designed to encompass all possible musical change that may arise in that time. The word ‘millennium’ doesn’t just refer to a period of a thousand years, either, but also suggests a new era, one with generally positive connotations. My hope – barefacedly idealistic enough to rival those of the modernists of precisely a century ago – is that it will see the virtually infinite possibilities of music more easily accessed by humanity as a whole. If nothing else, this is at least a goal for modernist music. Why human music-making? Are there other kinds of music-making? Perhaps – but here, ‘human’ is intended not so much as a qualification for or an all-too-tragic limitation on musical possibility than as an invitation to it. Humanity doesn’t equate to a set of given biological, evolutionary or social constraints, but is constantly adapting and developing from the old, familiar and limited humanity to new forms of humanity, using tools and technology and increasing its capacity for imagination and information as it does so. Music goes along with it, as a part of this process. "The title of Adam Harper’s Infinite Music: Imagining the Next Millennium of Human Music-Making appears to promise a broadly positive work about the continuing relevance of modern music, so to be met on the first page by the dour assessment that “serialism has all but died out [and] faith in musical modernism has subsided” is somewhat disconcerting. However, it quickly becomes apparent that Harper does not wish to sound the death knell for serialism but to recontextualise it, to rescue it from obsolescence. The trap that many modernist “composers” (and the definition of the term is contested herein) fall into, Harper suggests, is one of treating modernism as a series of conventions and techniques. What they should really be doing, he argues, is using the spirit of such devices as a means of reinventing every aspect of music-making. Harper writes of an “old modernism” for which the groundbreaking innovations that once made it so radical—such as the 12-tone technique—have now become like the conventions they sought to undermine. Modernism has become trapped, subjected to the preservationism—the insistence on performing and composing in the “correct” manner—that afflicts many musical styles, from popular to folk to classical. What is more, the conventionalisation of the erstwhile radical facets of this “old modernism” further serves to highlight the aspects of musical performance that have been left uncontested. This has resulted in many so-called modernist performances that claim to be “explorational” whilst often tacitly preserving many of the trappings of the traditional classical musical world. Most in need of radical overhaul, the main body of Infinite Music suggests, is the conservatism surrounding performance and composition. For the former is often presented in the recognisable manner of a classical concert in which the audience sits in silent reverence as the artists “explore”, while the latter still maintains its air of prestige and exclusivity. It is these two facets of music-making that Harper aims to revolutionise. “Where do we draw a line around what musical variables composers observe and potentially serialise?” asks Harper. “We don’t. That was the old serialism, the old modernism”. Harper is searching for a more holistic musical egalitarianism, one that treats timbre, instrumentation, and performance conventions with the same levelling hand as serialism did pitch. “No restrictions whatsoever” is what Harper demands of this new modernism, and it is a cri de coeur that is as meticulously and thoroughly explained as it is inspiringly progressive. But in this utopian desire to rid the modernist musical landscape of all restrictions, Harper hints at two caveats that need adding. The first is that the abnegation of restrictions must allow for aspects of conventional musical language to be incorporated into the resultant sound world. Melody, harmony, and most importantly, repetition and recapitulation of ideas must be included in this new modernism, for it is these devices that facilitate a sort of real-time dialogue between composer (or musician) and audience. The opportunity to second-guess the flow of the musical narrative, and to have those guesses either confirmed or contradicted, is where one finds delight in musical performance. Harper suggests as much in positioning the music created by modernism “somewhere between the old and familiar…it’s a relation between old and new”. This liminality affords the music a chance to comment upon all conventions of music making, whilst seeking avenues literally to modernise their usage. Truly modernist music “must also situate itself with respect to the familiar in some way, however small, and this link with or establishment of the familiar is what can facilitate appreciation”. But this facilitation of appreciation is not simply a means of forcing modernist music out of the cloistered, elitist world Harper suggests it now inhabits. Nor is it to popularise and heighten the influence of the music in a manner that modernism in its old guise, Harper claims, singularly failed to do. What this endeavour attempts is to rupture perhaps the most pervasive convention of music-making: the idea that the audience is a passive receptor of the musical meanings of the composer/musician. This leads to the second caveat, one that Harper touches upon in his egalitarian approach to the definition of the composer. In broadening the definition of this otherwise exclusive concept to include all those engaged in music making, proclaiming “we can all be composers, and we are all composers”, Harper alludes to Christopher Small’s concept of “musicking” (addressed in greater detail later in the book). Harper explores Small’s notion that everyone engaged in the process of music-making—even (or perhaps especially) the audience—is engaged in a process of “musicking” that makes them integral to the creation of meaning. The necessity to include the audience in modernist music is evident from the above example. A dialogue that includes the old but challenges the new must be established, and the role of the audience in not only interpreting but creating the music must be recognised and celebrated by modernism, breaking once and for all that most recalcitrant of conventions: the schism between performer and audience. not just a single system [for the imagining of music] as was offered by serialism, but a system of systems, an infinite system allowing for the creation of subordinate musical systems or what will be called ‘musical objects’, describing how they interrelate and how they’re perceived (or not). It sees music as a complex system of variables relating primarily to the production of sound, and takes this idea to its infinitely variable conclusions.